In the previous essay, I discussed the two key conceptual issues at the heart of the Supreme Court’s Ordinances judgment (Krishna Kumar Singh vs State of Bihar). In this essay, I focus on two debates that arise out of the judgment: first, did the seven-judge bench overrule D.C. Wadhwa vs State of Bihar? And secondly, was Justice Chandrachud correct in holding that there was a distinction between an Ordinance “ceasing to operate”, and becoming “void”, for non compliance with the conditions laid out under Articles 123 and 213? And relatedly, was Justice Lokur correct in holding that there is no mandatory requirement of laying the Ordinance before the Legislative Assembly? Did the Supreme Court Overrule D.C. Wadhwa? In other words, while the Court held that in general re-promulgation would be a fraud on the Constitution, there may be special circumstances, where the Legislature, during its Session, was simply unable to consider the Ordinance. In such circumstances, re-promulgation would be acceptable. Notice that Justice Chandrachud explicitly framed the question in terms of D.C. Wadhwa (what happens if the legislature has too much business to transact and cannot consider the Ordinance? ), but instead of answering it directly, only held that “Re-promulgation of ordinances is constitutionally impermissible.” While on the one hand he didn’t expressly hold that there could be no exceptional circumstances, and didn’t say that he was overruling Wadhwa, the unqualified statement: “Re-promulgation of ordinances is constitutionally impermissible” is quite a strong one. In fact, the Majority opinion’s relationship with Wadhwa remains curiously ambiguous throughout the judgment. Immediately after this, in Section J2, the Court cited Wadhwa, and then critcised it for only expressing a “hope and trust” that repromulgations would not happen (hope and trust that was soon belied). It then returned to Wadhwa in Section M, while discussing the actual repromulgations in the present case. It specifically observed that Wadhwa had been “criticised” for its “exceptional circumstances” escape clause, especially given that it was always open to the House to the government to seek an extension of a legislative session so that an Ordinance could be considered. But then, the Majority held that “be that as it may, it is not the case of the State of Bihar in the present case that there was any reason or justification to continue with a chain of ordinances nor is there any material before the court to indicate exceptional circumstances involving a constitutional necessity.” Or, in other words, it did not need to consider the criticism of Wadhwa. While the previous Section that we considered (J2) indicated that the seven-judge bench of the Court was overruling Wadhwa by stating in an unqualified manner that repromulgations were a fraud on the Constitution, this Section (M) indicated the other way, because the Court noted the criticism of Wadhwa and then said that it was irrelevant to the present case. So did Krishna Kumar overrule Wadhwa? Justice Chandrachud held that on disapproval by Parliament, or on failing to be laid before Parliament, the Ordinance would “cease to operate“. He held that the word “cease to operate” carried a different meaning from the word “void“; and given that Article 123 itself used the word “void” elsewhere, clearly, the two meant different things. Consequently, it could not be held that failure on disapproval or lapse, the Ordinance would become void ab initio. Meanwhile, in his partially dissenting opinion, Justice Lokur held that despite the presence of the word “shall” (every such Ordinance…shall be laid before the legislative Assembly“), laying of the Ordinance before the Assembly was not mandatory. Justice Lokur advanced a structural reading of Article 213 (and, by extension, Article 123). He observed that Article 213 simply stated that if an Ordinance was not laid before the Assembly, it would ipso facto expire six weeks after the Session began. That was the only consequence contemplated by the Section, and in the absence of anything else, it could not be presumed that there was any other consequence to not laying the Ordinance before the Assembly. Given that in all circumstances the Ordinance would lapse at the end of the six weeks, it could not be held that laying it was “mandatory”, in any meaningful sense of the word. In this section, I will argue against the views of both Justice Chandrachud and Justice Lokur. Although they were addressing two separate points, in my view, both contentions are adequately answered by the same response, which is grounded in the separation of powers, and the supervisory role of the Assembly under Articles 123 and 213 (a point repeatedly emphasised by Justice Chandrachud). Let us start with the separation of powers. Separation of powers is a basic feature of the Constitution. Separation of powers, in the Indian constitutional scheme, does not mean a rigid separation of legislative, executive and judicial functions, but, as held in Indira Nehru Gandhi vs Raj Narain, the existence of “checks and balances”, and ensuring that one organ of the State does not “predominate” over the others. Now, according to Article 123, a condition precedent to the exercise of the President’s ordinance-making power is that “circumstances exist which render it necessary for him to take immediate action.” The system of checks and balances requires a degree of scrutiny over the exercise of this power. However, since the purpose of Article 123 is to equip the President to deal with emergencies, any check or balance upon his power must be post facto and not ex ante (unlike, e.g., the assent requirement for passing bills). One possible check, that is judicial review, is highly circumscribed, and – after this judgment – limited to the Bommai standard of scrutinizing only the existence of material, and not the reasonableness of the decision itself. However, the Constitutional scheme itself provides for a more substantive check upon the Executive’s misuse of the Ordinance-making power, and that is through a requirement that the Ordinance shall be placed before both Houses of Parliament, and “cease to operate” once six weeks have passed after the Parliament re-assembles, or if both Houses pass resolutions disapproving of the Ordinance. If – as per Justice Lokur – this requirement was not mandatory, the Constitutionally-imposed check would become irrelevant. Justice Lokur might respond that the check lies in the fact that whatever happens, the Ordinance lapses after six weeks. What stronger check could there be? To answer this, we need to go into history. A perusal of the history of the Ordinance-making power reveals that the requirement of placing the Ordinance before the legislature was not always a condition. In the 1861 Indian Councils Act, and in the 1915 Government of India Act, there was no such requirement; however, there was another kind of check, which was that the Ordinance would expire after six months (i.e., Justice Lokur’s suggested remedy). Under Section 72 of the Government of India Act, 1935, the requirement of placing the Ordinance before the legislature was introduced for the first time, and was incorporated into Article 123 of the Constitution. Note that this requirement replaced the six-month sunset clause. During the Constituent Assembly Debates, attempts to reintroduce a sunset clause were defeated, on the stated ground that because an Ordinance had to be placed before Parliament, the longest possible period that it could last was seven and a half months. The importance of this requirement (i.e., of placing the Ordinance before Parliament) was highlighted by Dr Ambedkar, when he pointed out that the Assembly had consciously not incorporated the equivalent of Sections 43 and 44 (which did away with this requirement) into the Constitution, but only Section 42. In other words, the Constitutional history shows that faced with a choice between automatic expiry and “laying” before the Assembly, the Constituent Assembly consciously chose the latter. The Assembly’s choice would be set at nought if the requirement of laying was considered to be optional. Now, this history is coupled with the fact that since Ordinances – as held by Justice Chandrachud himself – are an exception to the normal rule of the legislature making laws, and not a “parallel system of lawmaking”, the requirement of checks and balances ought to apply with an even greater force in the case of Ordinances. 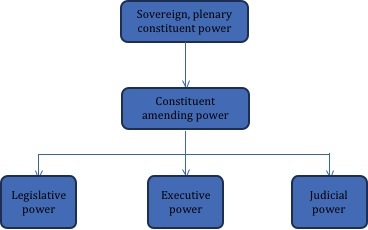 A combination of these arguments leads to the inference that the requirement of placing the Ordinance before the Parliament is meant to enable Parliament to act as a post facto check upon the President’s use of the Ordinance-making power, and to review whether there actually existed a situation of emergency that warranted the use of the power, or whether the Executive had abused its authority (which makes the case for mandatory laying even stronger). This proposition may be buttressed by the following: In R. K. Garg vs Union of India, the Supreme Court held that the Ordinance-making power was meant to “tide over” an emergent situation, and that the executive is “clearly answerable to the legislature”. R.K. Garg also held that – if the President, on the aid and advice of the executive, promulgates an Ordinance in misuse or abuse of this power, the legislature can not only pass a resolution disapproving of the Ordinance, but can also pass a vote of no confidence in the executive. Consequently, according to R.K. Garg, the placing of the Ordinance before the Parliament is for the purpose of ensuring that the executive remains answerable to the primary law-making body, and also for the legislature to act if, in its opinion, the President abused his power. Consequently, when the Ordinance is placed before Parliament, Parliament’s task is somewhat analogous to that of judicial review of legislation – i.e., to ensure that the conditions precedent for the Ordinance to be valid (i.e., the situation of urgency) actually existed when the Ordinance was passed. Therefore, if the Parliament fails to endorse the Ordinance – either through a Resolution signifying disapproval, or through conscious inaction allowing the Ordinance to lapse – then such action should count as Parliament’s assessment that the conditions precedent for passing an Ordinance were not satisfied, and as a result, the Ordinance is void ab initio. And therefore, contra Justice Chandrachud, the term “cease to operate” in Article 123 should be given this meaning. To this, the following argument may be added. In particular, there is no requirement for public deliberation/debate or discussion before an Ordinance is promulgated. One of the core features of the rule of law, which has been held to be part of the basic structure, is the requirement of publicity: i.e., laws should only be framed after a public, deliberative process. Because Ordinances are meant to deal with emergency situations, this essential feature of the rule of law is dispensed with under the Constitution; however, as submitted above, this leads to a serious democratic deficit with respect to ordinances. The constitutional scheme seeks to correct this deficit post facto by the requirement that the Ordinance be laid before the Parliament when it opens, so that one essential step of lawmaking – that of public deliberation in the House – is fulfilled, even if it is after the fact. For this reason, the laying of the Ordinance before the Parliament must be considered an integral part of the Ordinance-making power, and not merely a subsequent event. If the laying before Parliament is an integral part of the Ordinance-making process, then until this happens, the Ordinance should be considered to be only conditionally or presumptively valid – that is, it enjoys the “force” and “effect” of law, but remains legally incomplete until it is deliberated by Parliament. Consequently, acts done under the Ordinance should also enjoy a conditional validity, and any permanent or enduring effect should be subject to the Ordinance itself being ratified or enacted into law. This incidentally, addresses Justice Lokur’s concern in paragraph 15 of his judgment, where he rejects the contention that Ordinances have no “force and effect of law” until laid before the Assembly, on the ground that “the force and effect of a law cannot depend on an uncertainty and the occurrence of a future event, unless the law itself so provides. An Ordinance, on its promulgation either has the force and effect of a law or it does not – there is no half-way house dependent upon what steps the Executive might or might not take under Article 213(2) of the Constitution.” The halfway house, as I have argued, is the doctrine of conditional validity. A combination of all these reasons, I would respectfully submit, makes the case for the laying of the Ordinance before the Assembly to be mandatory, contra Justice Lokur; and it also provides a powerful alternative to Justice Chandrachud’s view: notwithstanding the use of the word “cease to operate” and “void” in Article 123, there is good cause to hold that lapse or disapproval of an Ordinance makes it void ab initio, and that means that all acts done in the meantime automatically go. (Disclaimer: The author assisted in legal arguments on behalf of Interveners taking the position that there ought to exist judicial review of the circumstances in which Ordinances are passed, and also that Ordinances do not create enduring effects).